Juniper (Juniperus spp.) is one of the most tried-and-true bonsai plants, even for novice bonsai gardeners. Some junipers are naturally prostrate, such as Juniperus chinensis var. sargentii, while others are upright, such as Juniperus chinensis "Fairview" -- both perennials in U.S. Department of Agriculture plant hardiness zones 4 through 9. Regardless of their natural shapes, all juniper bonsai specimens are trained to resemble miniature trees, and they all require the same care. 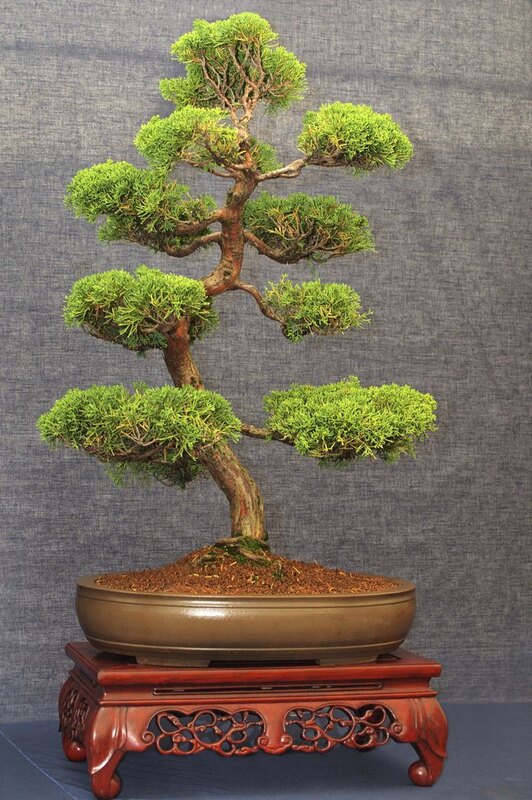 If needed, prune juniper bonsai from spring to midsummer. The art of bonsai requires you to prune a plant's roots and grow it in a small, shallow container. With the roots restricted this way, the plant's top growth develops into a miniature version of the plant's natural shape. Because the small pots contain a limited amount of soil, adequately watering and fertilizing a juniper bonsai is critical to its health. The American Bonsai Society recommends letting the soil dry slightly before watering your juniper, but cautions against allowing it to dry completely. If the soil surface is dry, water thoroughly until the excess flows from the pot's drainage holes. From spring to early summer, fertilize with a 20-20-20 water-soluble formulation for potted plants, which is typically 2 teaspoons of fertilizer dissolved in a gallon of water applied at a rate of 1 quart per square foot of soil. Follow the label recommendations if they vary from this example. Withhold fertilizer in the summer and use the same formulation at one-quarter the recommended rate in the fall. 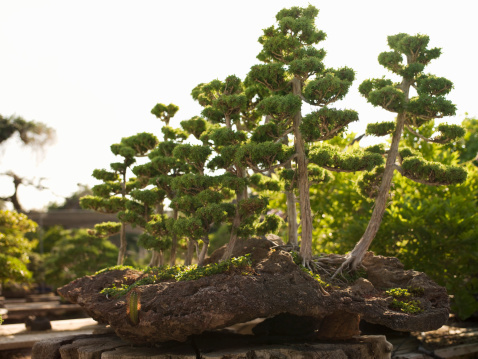 Juniper bonsai trees flourish in full sun as long as the soil does not dry completely. They grow best when they are periodically repotted. Typically, plants up to 6 years old need to be repotted every two years. Older plants need repotting every three to five years. You can repot juniper any time during its growing season, but withhold fertilizer for 30 to 60 days afterward. You can use a commercially prepared mix labeled for bonsai, or you can make your own. A suitable potting mix includes equal parts of humus or ground pine bark, sand or perlite, and clay. Typically, pruning a plant means trimming the above-ground parts. But to care for a bonsai plant, you must also prune its roots. Allow juniper to grow in its container with the roots intact unless it shows signs of decline, the roots heave it out of the pot or it's time to repot it. At any of these times, remove the plant from its container, remove the soil from around the roots and comb the roots gently to separate them. Cut out the roots that have become stiff and wiry, and trim the softer fibrous roots, spreading them out when you repot the plant. Shape the top growth as desired by using scissors or hand-held pruners to snip the stems. Don't use pruning tools to cut across the evergreen needles because the cut surfaces will turn brown. Instead, pluck out the tender new growth with your thumb and forefinger to style the plant. Sanitize pruning tools to mitigate the spread of disease by immersing them for five minutes in a solution of 1 part bleach and 3 parts water. Rinse the pruners with water before making any cuts. The small size of juniper bonsai makes it easier to remove pests by hand instead of using chemical treatments, which may overwhelm the small plants. Spider mites are occasionally bothersome. You can identify these pests by gently shaking the juniper branch over a sheet of white paper. If mites are present, they will drop and crawl on the paper. Spraying the foliage frequently with water dislodges the mites. Bagworms are the larval state of a moth that construct bag-like cocoons, which house the larvae as they feed on juniper foliage and encase the larvae when they pupate. It is easy work to handpick these cocoons and destroy them so caterpillars cannot feed on the plants.